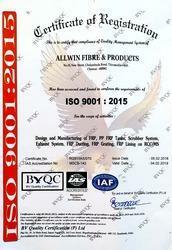 Incepted in the year 2003 at Chennai (Tamil Nadu, India), we "Allwin Fibre & Products” are recognized as one of the prominent manufacturers and suppliers of Fibre Glass Reinforced Plastics (FRP) Products such as Fibre glass reinforced Plastics Tanks, PP-FRP Tanks, FRP, PP- FRP Vessels, FRP, PP- FRP Scrubbers, Fiberglass Gratings, FRP Vessels and FRP Blowers in Tamil Nadu. These products are fabricated as per globally accepted norms & standards like BS 4994-1987, AST M-D-2996, and ASME using finest quality of polyesters & epoxies & thermoplastics like PP, PVC - FRPs are typically organized in a laminate structure, such that each lamina (or flat layer) contains an arrangement of unidirectional fibers or woven fiber fabrics embedded within a thin layer of light polymer matrix material. The fibers, typically composed of carbon or glass, provide the strength and stiffness. The matrix, commonly made of polyester, Epoxy or Nylon, binds and protects the fibers from damage and transfers the stresses between fibers. Our products range is highly acknowledged for its easily installation, finest quality, technologically advanced and longer service life. We are also involved in providing our services in product development, fabrication of industrial and domestic products in FRP and acrylic, project consulting and installation, turnkey projects undertakings, coloring and framing. We welcome queries for FRP Products from South India region like Dravida including Andhra Pradesh, Karnataka, Kerala and Tamil Nadu. With the assistance of our team of professionals, we are capable to provide the excellent quality of FRP products. Our quality controllers strictly tested these FRP products on various parameters at par with the international quality standards. These products are fabricated in full observance of predefined industry standards. As per the ever changing technology and demand of industry, we have developed the sound manufacturing facility for the utmost durability and finest quality. Due to our ethical client centric policies, transparent business dealing and timely delivery we are successfully attain the well recognized position in our domain. We have established the high end infrastructure facility equipped with all the latest technologically advanced machinery and tools, which are required for production to delivery the finest quality range of FRP products. This facility is divided into various divisions such as manufacturing unit, research and development and quality testing unit for proper production and storage. As per the ever changing demands of industry, we have developed the sound infrastructure facility coupled with the latest technologically advanced machinery and tools. Our state-of-the-art infrastructure ensures us to undertake the mass orders of clients and deliver them within promised time frame. As quality centric organization, quality is the major priority of our organization. We have employed the highly experienced team of quality controllers. For faultless and finest quality FRP products, our quality controllers strictly monitors these products on various parameters such as visual test, hydro test and pressure test at par with the international quality standards. These products are fabricated as per globally accepted norms & standards like BS 4994-1987, AST M-D-2996 and ASME using finest quality of polyesters & epoxies & thermoplastics like PP, PVC, CPVC, PVDF, FEP, ECTFE, PTFE and TFM that ensures the unmatched quality products to our clients. Backed by a team of professionals, we are able to fabricate superior quality and innovatively designed FRP Products. For the faultless and finest quality FRP products, we have employed the highly experienced professional team. Our experts prefer to work in close coordination with clients to conceptualize their specific requirements. Quality controllers ensure us for providing the faultless quality of products by strictly testing these products on various parameters. Our team has rich expertise to handle all the installed machinery & tools. Moreover, we frequently provide the crucial industrial training to our team to keep them attentive and abreast to the latest industrial advancements. These are some application areas of our organization, which are suitable for all types of weather products with 10 years long warranty. Industrial Warehousing sheds, site cabins, security cabins, shelters, canteens, etc. Domestic Parking sheds, room extensions, toilets, bathrooms, roofing’s, etc. Transportation Bus stations, ticket counters, shelters, etc. Being a client centric organization, we continuously endeavor hard for maintaining the healthy relations with our clients. Our team works in close coordination with clients to conceptualize their specifications and deliver them within promised time schedule. We use finest quality polyesters & epoxies & thermoplastics like PP, PVC, CPVC, PVDF, FEP, ECTFE, PTFE and TFM as per globally accepted norms & standards like BS 4994-1987, AST M-D-2996 and ASME for fabricating our product range. Our after sales services also help us to maintain healthy relations with our clients. 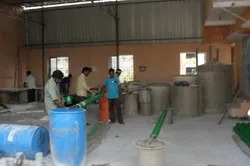 With the assistance of our team of professionals, we are counted amongst the foremost manufacturers and suppliers of FRP Products such as Fiber glass Tanks, Fiber Tank, FRP Cooling Tower, PP FRP Vessels, PP FRP Scrubbers, Fiberglass Gratings, HDPE Tanks, FRP Vessels and FRP Blowers.